Dunville & Co was a company that blended pure pot still whiskey as well as importing tea in Belfast. The company was founded by John Dumvill who joined William Napier of Napier & Co. The spelling of Dumvill was changed to Dunville and in 1825 the company name became Dunville & Co. In 1837, Dunville began producing its most popular whisky Dunville's VR. 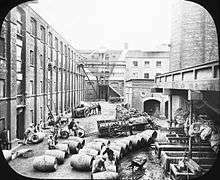 The Royal Irish Distilleries were built by Dunville in 1869. The Prohibition caused Dunville to lose its America market and despite its repeal, Dunville did not recover sales in America. The last heir and chairman of Dunville, Robert Lambart Dunville, died in 1931 leaving the company to its Directors and in 1936 Dunville & Co. was liquidated. 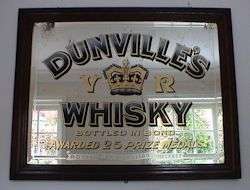 Dunville's Whisky was the main brand name of Dunville & Co, and was used in advertisements, on pub windows and pub mirrors, and on whisky dispensers, water jugs, trays, match strikers, ash trays and playing cards. Although Dunville & Co was established and based in Ireland, before the Partition of Ireland, and Irish whiskey is normally spelt with an 'e' in 'whiskey', Dunville's Whisky was always spelt without an 'e' in 'Whisky'. In 2013, almost 80 years after the last Dunville's was distilled, the Echlinville Distillery revived the Dunville's brand, and began distilling at their facility in the Ards Peninsula. Previously they had purchased spirits from other distillers and aged it themselves. Dunville's VR Old Irish Whiskey and Dunville's Three Crowns Irish Whiskey from The Echlinville Distillery came on the market in 2016. John Spencer Dunville VC (1896-1917) was the second son of the fourth chairman, John Dunville Dunville (1866-1929). John Spencer Dunville was wounded in action near Épehy in northern France on 25 June 1917, and died from his wounds the next day, 26 June 1917. He was posthumously awarded the Victoria Cross for his actions. The Distillery Football Club was formed in 1880. The Directors of Dunville & Co. gave the football club their support and filled in a waste pond at the back of the distillery to create the club’s first football ground. The football club has continued to thrive long after the closing of the distillery company. It changed its name in 1999 to Lisburn Distillery, after the location of its current home ground in Northern Ireland. Known affectionately as "The Whites", the club provides football for all ages from 8 years old up to senior football. Its current shirt sponsor is The Echlinville Distillery, who have resumed the production of Dunville's Whiskey. So once again the football club is associated with the Dunville name. 1 2 Miles Holroyd. "The Dunville Family of Northern Ireland and Dunville's Whisky". 1 2 MH. "Dunville's Whisky Collectables". ↑ Newenham, Pamela (23 January 2014). "Irish Whiskey brand returns 80 years after Prohibition". The Irish Times. Retrieved 23 January 2014. 1 2 "The Echlinville Distillery". ↑ MH. "John Spencer Dunville VC (1896-1917)". ↑ MH. "The Dunville Family of Northern Ireland and Dunville's Whisky: Robert Grimshaw Dunville". ↑ "Lisburn Distillery Football Club".